It's officially the dead of winter and that means it's cold in a lot of this hemisphere. Really cold. Earlier this month we decided that our interest in our own warming recipes are waning, and we thought yours might be too. With a flash of insight, the team realized that we have a whole community of foodies that could we could entice to recipe swap. We asked via email, “what is your favorite warming recipe,” and you really pulled through. We got a ton of fantastic responses, but here are the four that made our mouths water. Brown onions in your pot in butter or olive oil. Add garlic, curry powder and ginger for 30 sec and then add 3 cups water. Add lentils, carrots, sweet potato, mushrooms, rosemary and, oregano. Optional: Add 3 T of Pesto, cilantro or parsley. 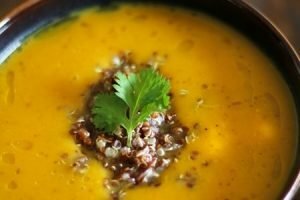 Bring to a boil and cook until your carrots and sweet potato are to your liking (15 min for a bit of crunch, 30 min for more soft). Then add 2-3 sliced hot dogs (or veggie sausage links if vegetarian) and cook 5 min until heated. Add salt and pepper to taste. Add 2 T sour cream before serving. Opo squash cut in half lengthwise and remove the core. Cut lengthwise again. Cut about an inch thin strips. Marinate shrimp with first 8 ingredients for at least an hour of course overnight is best. In Medium pot, sauté shrimp until fragrant then add chicken broth and water. Once boiled, take out shrimp so it doesn’t over cook. Wait to boil again to add Opo squash. Reduce to Med heat. Season broth with more fishsauce, sugar, salt , and pepper to your liking. Cook the Opo for 15 mins. Add back shrimp. Opo is done when almost translucent. Set to low heat then add all the scallions and cilantro. You can add as much cilantro and scallions as you like. For extra flavor you can sprinkle fried garlic. All you do is sauté fresh garlic and oil. Easy peasy. That’s it! Make it and share it. Optional topping – Thin sliced green onions (scallion), spoon of plain yogurt or sour cream. Sauté carrots and onion in oil 5 minutes. Add dry herbs and garlic. Sauté and stir about 1 minute to toast the herbs. Add tomato purée and beans. Add salt and pepper to your taste. Bring to boil, then simmer 10 minutes. Cook longer if you want carrots soft. Ladle into bowls and top with sour cream (or plain yogurt) and scallions. What's your favorite warming recipe? Let us know in the comments below. Cook quinoa in broth until water is absorbed – about 20 minutes. Meanwhile saute onions in oil. Add garlic and mushrooms. Add more oil as mushrooms absorb a lot. Add greens and cook until wilted and mushrooms change color. Add slivered almonds, S & P, raisins and a few splashes balsamic vinegar. Heat through then add cooked quinoa.